Both sides cancel each other out, although Cenk Sahin came close for winning the game for the visitors late on. 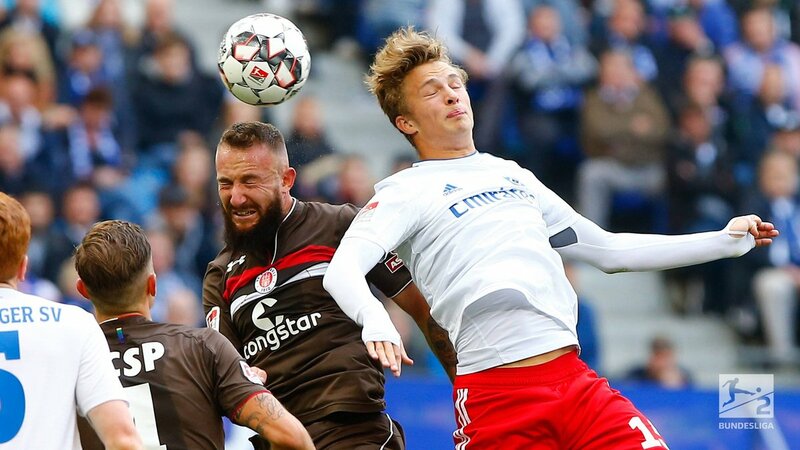 The first Hamburg derby since 2011 failed to live up to the hype as Hamburger SV and FC St. Pauli played out a goalless draw in their first-ever 2. Bundesliga meeting. Both goalkeepers were rarely tested, as HSV drew another blank following their draw at SpVgg Greuther Fürth on Thursday night. After all the hype surrounding this fixture it was clear that the players were ready to do battle on a sunny late September afternoon in Hamburg for the first derby in seven-and-a-half years. Plenty of challenges were flying in, with a St. Pauli free-kick leading to the first chance of the game. Marvin Knoll put it into the box, with Johannes Flum heading at Julian Pollersbeck. As has been their way this season, Hamburg looked to control the pace of the game with steady possession, but their first really chance on goal only came halfway through the first 45 minutes, as David Bates flicked on a corner. Around that time, St. Pauli began to push themselves on as well, but it remained a tetchy affair. Fiete Arp, leading the line for the hosts, had been quiet but had a couple of chances before half-time, headed wide a Gotoku Sakai cross before forcing his way into the box, eventually losing the ball to Philipp Ziereis. St. Pauli had two decent opportunities too, with Mats Møller Dæhli blocked in the before Dimitrios Diamantakos half-volleyed wide. The second half started slowly as well, with Orel Mangala going over after testing Robin Himmelmann with a free-kick. Around the hour mark the game began to fire up though. A poor header from Diamantakos was saved by Pollersbeck, before Hamburg broke away. Mangala found Hwang Hee-chan, whose first effort in the box was blocked, but the ball ricocheted back to him, and he went wide with the second attempt. A number of substitutions broke up the game as it continued to be a battle. Arp was wrestled off the ball as he tried to run in the box, before being taken off, whilst St. Pauli had a couple of half chances as a Cenk Sahin effort was saved and Christopher Buchtmann went over. There were big appeals for penalty from the hosts when Mangala fell over a grounded Ziereis, but the referee showed little interest. There was then light relief as Douglas Santos wasted a short corner, taking it before Tatsuya Ito was ready and hitting the corner flag as well. St. Pauli would have been the happier of the two sides in the end, but they had chances to win it late on. A Knoll shot outside the box but went, but on the counter Sahin nearly caught out Pollersbeck, wrestling the ball off Santos before attempting to lob Pollersbeck from just outside the centre circle, but the goalkeeper just tipped the effort over the bar. There had already some rather ugly scenes around Hamburg in the build-up to the game, and it was clear that the animosity between the clubs had rubbed off on the players, not least in a rather unwise Instagram post by Arp before the game. On the pitch in the first half, Lewis Holtby was clearly pumped up, clashing early with Ziereis before celebrating winning a corner like he had scored. St. Pauli’s players weren’t afraid to get stuck in either, with two yellow cards in the first half and Knoll not letting many past him without going through them. Titz shuffled his pack up front again here, with Arp and Hwang coming in for Lasogga and Khaled Narey, yet they failed to score for a third game in a row, despite scoring ten in their previous four, and like against Fürth there weren’t many chances for them to either. Whilst at the back he has settled his mind on his defensive line, Titz seems unsure of whether the likes of Aaron Hunt, Ito, Hwang and Narey should play out wide, or whether he can trust either of his strikers in Pierre-Michel Lasogga and Arp, who despite his best efforts couldn’t make much happen on his first start of the season. With 1. FC Köln starting to pull away at the top, Hamburg will need to find more consistency going forward, in selection and results, if they are likewise to assert themselves in the promotion race. It was a day for the defenders, with Bates once again showing why he should be an automatic first choice for Hamburg as they kept another clean sheet with his presence on the field – he even had their better chances in front of goal in the first half. Ziereis and Christopher Avevor were rocks at the back for St. Pauli, the former making some vital interceptions. Dæhli and Sahin were lively on their wings, with the Turk almost winning it in stunning style.